Fort Wayne doesn’t have a BBQ tradition of its own, so residents don’t feel the need to fiercely defend one. 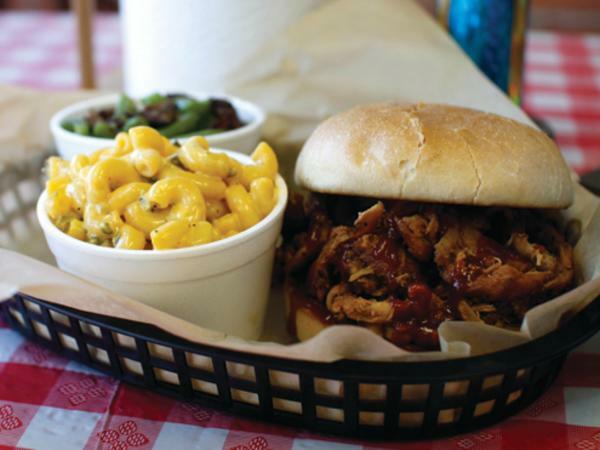 Unlike places that are famous for BBQ, Fort Wayne hasn’t come close to achieving its BBQ peak. 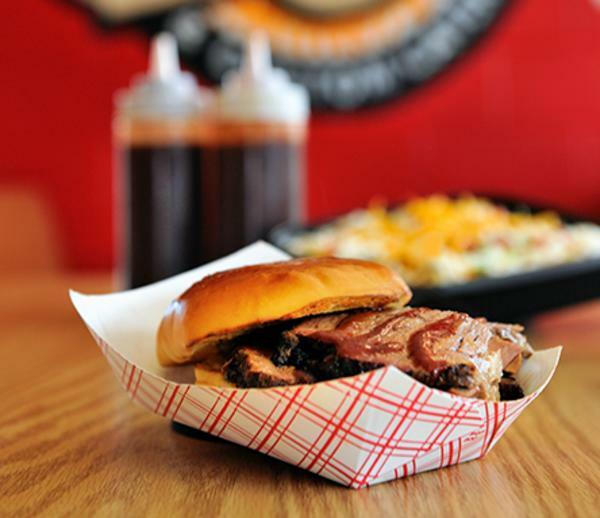 BBQ joints will continue to proliferate. Ziffles Rib Bar is one of Fort Wayne’s oldest rib joints. It opened in Georgetown Square in 1987 and is known for serving some of the largest rib portions that a person can find outside of a Flintstones cartoon. The Hog Trough, which is like BBQ’s answer to poutine, features French fries covered with cheese, pulled pork and house-made slaw. And then there’s The Barnyard: a giant platter filled with ribs, rib tips, pulled pork, chicken wings, French fries, garlic bread and slaw. Not all BBQ is created equal. Anyone opening a new BBQ joint in Fort Wayne has to contend with the sterling reputation and accomplishments of Shigs in Pit. It started in 2005 as a competitive pit crew affiliated with Mad Anthony Brewery. It has since grown into two popular brick-and-mortar restaurants. Shigs in Pit is where Fort Wayne’s smoked meat cognoscenti hang out. Even in the context of Fort Wayne’s growing smoked-meat landscape, Lucille’s has distinguished itself. It does brisket, ribs, turkey, chicken and ham to perfection. It offers a variety of ways to sample many different BBQ traditions; you can try South Carolina’s mustard-based sauce, Texas-style sauce (designed to be paired with brisket) and St. Louis-style ribs. There are a few items on the menu that you won’t find anywhere else including the Chopped Brisket Caesar Salad, Smoked Onion & Bacon Brussels Sprouts and Brunswick Stew, which is Georgia’s and Virginia’s answer to chili. Blue Stack Smokehouse is regionally renowned for its rubs. The ribs and brisket, which are melt-in-the-mouth amazing, really don’t need sauce. And its proprietor also makes his own sausage. Blue Stack even proffers house-made poppers: bacon-wrapped jalapeno peppers stuffed with cream cheese and homemade sausage. When U.S. residents argue over BBQ styles, the Caribbean usually doesn’t come into it. But it should. The Caribbean has a slow-cooked-meat tradition all its own, and it is being practiced at Ivy’s Jerk Joint. The aforementioned tradition is called jerk. Caribbean jerk is a style of cooking as well as to the spices employed. Both are unique: the former having to do with special woods and the latter having to do with allspice berries and scotch peppers. Chicken is the meat usually featured in jerk cooking, but Ivy’s offers ribs and turkey as well — and on Friday and Saturday nights until 5 am. Backwoods BBQ doesn’t have the largest menu, but what it does, it does superbly: ribs, brisket, chicken and pulled pork. Triple B’s BBQ is highly-praised for its brisket. You may also want to try the brisket as part of Triple B’s barbecued nachos. It also has some fabulous sides like green beans with smoked turkey neck, coleslaw, potato salad, corn bread, loaded mashed potatoes and macaroni & cheese. People who walk out of Neighborhood Smokehouse BBQ tend to say things like “That was the best ribs, rib tips, turkey tips, smoked wings, pulled pork or fried catfish I have ever had.” And you can order a sampler featuring many of these “bests.” The side dishes are all inventive and well-made, but special recognition must be reserved for the fried green beans. 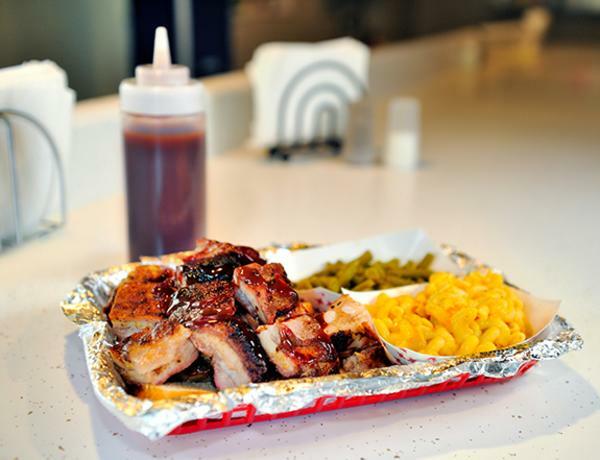 Rack & Helen’s in New Haven has never marketed itself as a barbecue joint, per se. But it has offered superlative BBQ and smoked meats for years. Try the hickory-smoked chicken wings, the St. Louis-style ribs and/or a diabolically delicious innovation known as the Big Pig grinder (pulled pork, ham, Ossian bacon, pepper jack cheese, fried onion straws, fried jalapeno straws, coleslaw and barbecue sauce on a crusty roll). 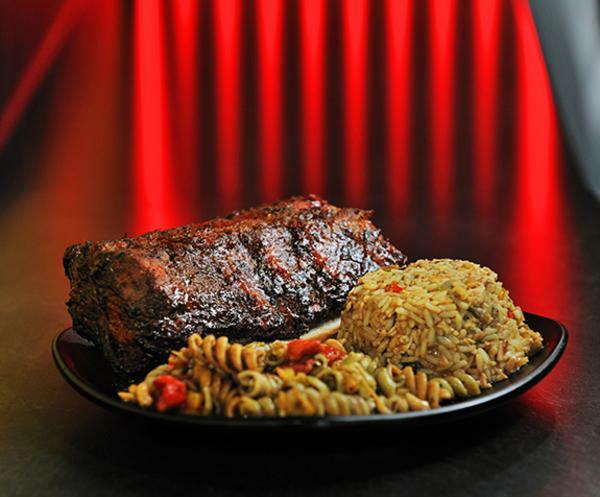 At the new Rack & Helen’s Social Club in Fort Wayne, executive chef Maria Wunderlin is offering a different spin — Memphis-style ribs with sweet Ancho barbecue sauce. 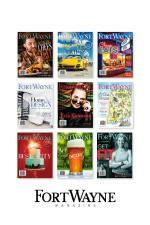 Article by Steve Penhollow, Phototography by Theresa Thompson except cover photo.